In 1989, when the Cold War ended, there were six permanent international courts. Today there are more than two dozen that have collectively issued over thirty-seven thousand binding legal rulings. 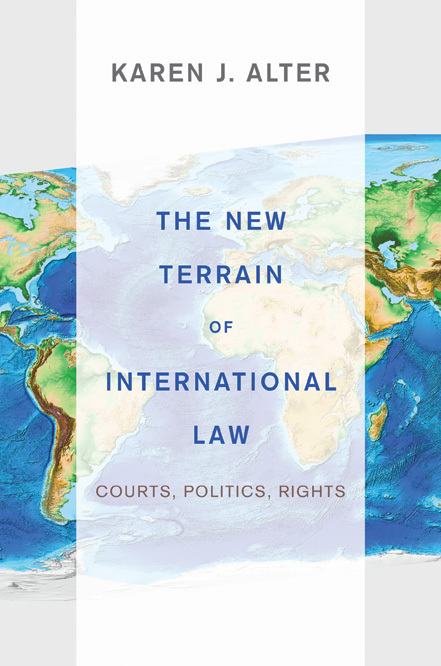 The New Terrain of International Law charts the developments and trends in the creation and role of twenty-four international courts, presenting an in-depth look at the scope and powers of international courts operating around the world. Focusing on dispute resolution, enforcement, administrative review, and constitutional review, Karen Alter explains how international judges' limited power--the power to speak the law-- translates into political influence. Comparing a broad range of international judicial bodies, issue areas, target countries, and regions of the world, the book's eighteen case studies collectively elucidate the political factors that often intervene to limit whether or not international courts are invoked and whether international judges dare to demand significant changes in state practices. Connect here for Q & A with the author about the book. "The New Terrain of International Law provides the most sophisticated account of how 'new style' international courts alter politics by reducing the monopoly power of governments to determine what the law requires. If you can read only one book on how international courts affect the politics of international law, this is the one to read." "This book gives a definitive account of the growing significance of international courts in global affairs. While the European Court of Justice has been considered the gold standard of supranational courts, Alter demonstrates the breadth of supranational courts spread across the globe. Showing how litigation before international courts can be a powerful tool, her book holds central policy implications." "International lawyers dislike having political scientists in their professional kitchen and political scientists often cannot conceal their disdain of 'naive' lawyers. Alter's carefully researched and insightful new book changes all that. There is no lawyer who will not become wiser from reading it, while many a political scientist will marvel at their failure to note a seismic change in the international order. Alter's voice is unique and indispensable." "This book is a landmark in the history of the study of international courts and tribunals--a true game changer. Sustained by a very thorough empirical analysis, it challenges a lot of established but outdated notions of what international courts and tribunals are and what they do."